Almost 100 dead or sick birds have been brought into the von Arx wildife hospital at the Conservancy since mid-November. MARCO ISLAND, Fla. - Almost 100 dead or sick birds have been brought into the von Arx wildife hospital at the Conservancy since mid-November . "It's physically exhausting going back and forth and back and forth and it's just sad," said Adam DiNuovo with the Audubon Society. Adam has been making the 40 minute trek from Marco Island to the Conservancy almost daily, dropping off birds. He arrived Thursday with another container of sick birds, one of which didn't survive the car ride. "A Sandwich Tern which unfortunately didn't make it, and a Royal Tern which looks like it's doing pretty well." Although they look physically healthy, the birds are found convulsing on the beach or unable to fly. Someone snapped pictures of two dead birds near Residents Beach at Marco Island, on Wednesday. "It's something where they're feeding, so the birds that we see on the coastline right on the shore, don't seem to be getting sick, and the birds that are feeding a little off shore, eating fish, are the ones that we're finding." 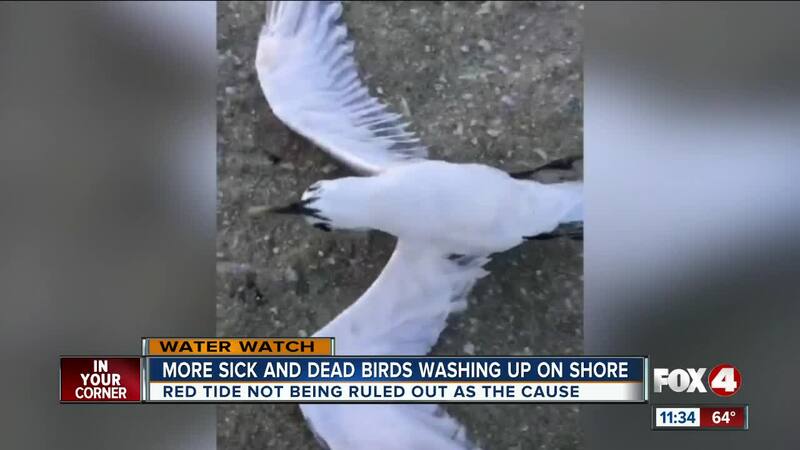 Results of necropsies done on the birds are still pending, but red tide isn't being ruled out as a possibility. A change in the wind pattern this weekend could bring red tide closer to Marco Island. "I would expect that I would be noticing red tide symptoms Monday on the beach," said DiNuovo. The Conservancy of Southwest Florida has been working almost non-stop to try and save the birds. Anyone who sees a sick or dead bird is asked to call the Conservancy or bring the animal in.